Westside Christian offers a Christ-centered education. 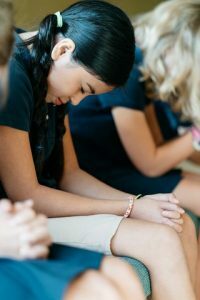 The Savior and his love for us are at the center of all we say, think, and do and is the foundation for our curriculum. 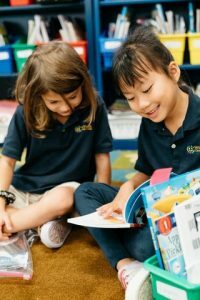 One of the key components of Westside Christian School curriculum is the Christ-Light religion series which is used in grades K – 4 and preschool. Voyages religion series is used for grades 5 – 8. This curriculum covers Old and New Testament Bible stories in an exciting, colorful, and memorable way. Each lesson has a key truth that is discussed and applied to our lives in a powerful and meaningful way. Lessons for grades 7 – 8 focus on age-appropriate topics relating to guidance the Lord has given us in his Word. This curriculum will give students a strong rooted base in God’s Word, allowing them to make wise, Christian choices throughout life. A clear understanding of the English language is important to the success of all areas of the curriculum and in everyday life. 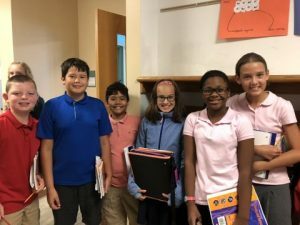 Our language arts program carries out that need by providing students opportunities and experiences in reading, writing, spelling, phonetic skills, grammar, penmanship, and public speaking. 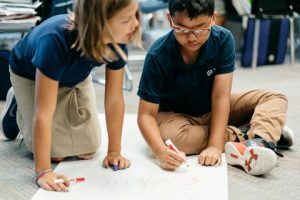 Students develop a desire for reading through instruction that uses high-quality literature, poetry, short stories, informational texts and narratives. 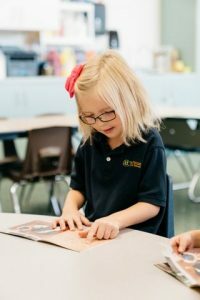 Westside Christian School strives to have their students increase their vocabulary and comprehension skills, while developing the ability to read critically. Most importantly, strong reading skills enable students to read and study God’s Word and to differentiate between God’s truth and the teachings of the world. We teach students to be proficient writers using various writing methods, culminating in the Excellence in Writing program and the five-step approach to writing. Students are given opportunities to write short stories, reports, poetry, essays, and journals. Grammar is taught and stressed throughout all grade levels. Students develop public speaking skills through experiences in show-and-tell, class presentations, and forensics. Handwriting Without Tears is our handwriting curriculum. Penmanship skills are maintained and stressed in all areas of the curriculum. Our overall goal is that students will be able to write and speak effectively in order to articulate the sure hope they have in Christ. Singapore Math is a teaching method based on the highly regarded national math curriculum used in Singapore. The method involves teaching students to learn and master fewer mathematical concepts in greater detail and teaching these concepts using a three-step learning process. The three steps are concrete, pictorial, and abstract. In the concrete step, students engage in hands-on learning experiences using concrete objects such as chips, dice, or paper clips. In the pictorial step, students draw pictorial representations of mathematical concepts. In the abstract step, students solve mathematical problems in an abstract way by using numbers and symbols. Singapore Math emphasizes the essential math skills recommended in the NCTM Curriculum Focal Points (National Council of Teachers of Mathematics), the National Mathematics Advisory Panel, and the proposed Common Core State Standards, though it generally progresses to topics at an earlier grade level than indicated by those US standards. At Westside Christian School, the study of history is the study of “his story”–-the Lord’s creation. Students gain a broad perspective of our world through the study of United States, Wisconsin state, and world history. Other components include instruction in government, civics, economics, and geography. Instruction and activities are structured to help students develop the following skills: critical thinking, decision making, understanding cause and effect relationships, and comparing fact and opinion. The goal of these experiences is to give our students the necessary tools to be active citizens in God’s world. The science curriculum at Westside Christian School allows children to see the wisdom and skill of our Creator. Unit lessons are taught at all grade levels covering the human body and physical, earth, and life sciences. Through the use of quality textbooks and hands-on learning, the students are actively engaged in experiments, projects, and presentations. These opportunities allow them to develop skills such as observing, comparing, hypothesizing, predicting, measuring, testing, and interpreting for a better understanding of the world our Lord created. The fine arts curriculum seeks to develop students’ art and music appreciation as well as their art and musical skills. Students are exposed to a wide variety of artists and their unique styles and classical works. Opportunities for students to work with different art mediums increase their knowledge and appreciation of art. The music program develops in students an appreciation and understanding of music, allowing them to glorify God through their voices and musical instruments. Numerous opportunities are available for students to learn music theory and apply that knowledge. Music recognition is taught through listening to selections from various composers. Students actively grow in their musical gifts through movement, rhythm instruments, and singing. Further opportunities to expand musical skills include the piano, band, and strings programs. Students also have opportunities to participate in plays as well as help design sets and stages. A performance is scheduled each year. The development and use of modern technology continues to change and shape our lives. In order to be proficient in this technology age, computer education at Westside Christian School begins in grade 3 with typing skills. Students have opportunities to use educational software that supplements all areas of the curriculum. The computer curriculum allows students to develop skills such as word processing, spreadsheets, internet research, and visual presentations. Teachers also use software programs that help them improve their lessons and classroom instruction. 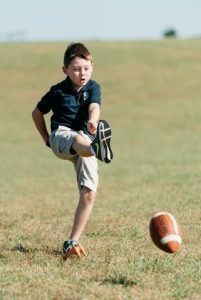 Physical education classes at Westside Christian School help students gain an understanding of physical development, well-being, and safety. Classes and activities develop gross motor skills, coordination, and an interest in sports and physical fitness. 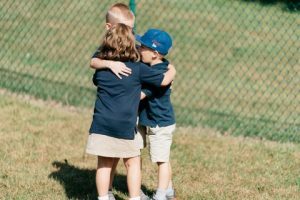 An emphasis is placed on Christian sportsmanship and helping students reach their God-given potential.